Here you will find one of the pages from our manual, available online or in book form. 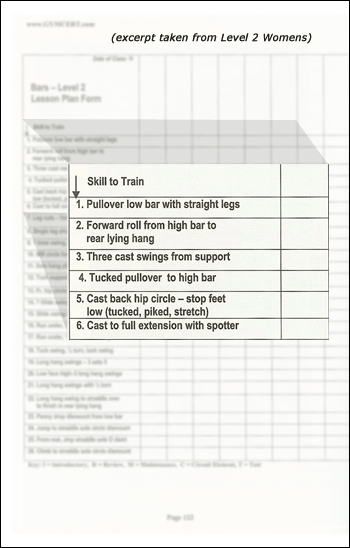 The chart below the page correlates to the technique within the sample page for use when you are coaching. This course material is fully illustrated and shows proper technique through the use of generous descriptions, pictures and online video. 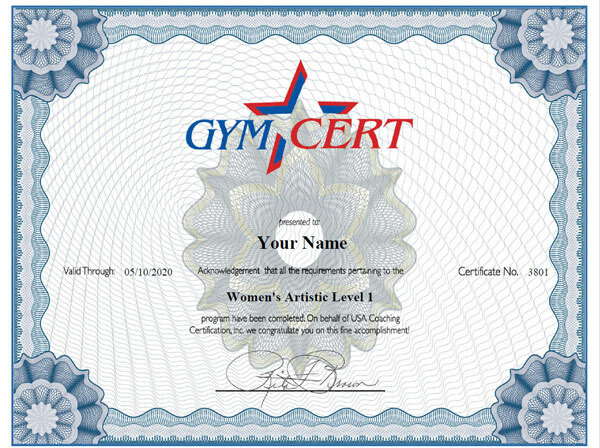 Once you have completed the course material, you will proceed to a certification test to verify what you have learned. Our exams are given on-line and consist of multiple choice and true/false questions. If you would like to see how are tests are presented, please click the link below to transfer to a practice exam that uses questions taken from actual tests. Click on the video below to see a sample of the streaming video you will find throughout the online training courses. The videos serve as a reinforcement to the course reading material with a helpful display of correct positioning and technique where applicable. Choose the correct answer by clicking on the appropriate radio button. When you click correctly, a black dot will appear in your choice. If you make an error, simply click on another spot and the black dot will change to your new choice. An example of "dynamic balance" is skipping down the balance beam. Before assembling any gymnastics equipment, it is important that all manufacturer’s information sent with the equipment be carefully read by the person assembling it. Although mat manufacturers are attempting to update and design mats that allow athletes to maximize their skill development while reducing risk of injury, to assume mats can eliminate the possibility of serious injury is both incorrect and dangerous. Choose the best possible answer from the four choices. Choose the answer by clicking on the appropriate radio button. When you click correctly, a black dot will appear in your choice. If you make an error, simply click on another spot and the black dot will change to your new choice. The single most important consideration in teaching the Sport of Gymnastics to children is? Length of class offered and size of facility. Provide a safe environment and warn of inherent risks. Assumption of Risk is defined as? Catastrophic injury, paralysis, or even death can result from improper conduct of the gymnastics activity. Participation in gymnastics involves motion, rotation, and height in a unique environment and as such carries with it a reasonable amount of risk. Carelessness cannot be allowed or tolerated. The readiness and ability level of the performer, the nature of the task, and the competency of the spotter all must be taken into consideration when attempting a new skill. What is the other name for this position ? One is Stride what is the other one?